Etudes students and instructors can bookmark a section in Modules so that they can quickly return to it later. A “Bookmark It!” link is included at the top right of every section of a module. For instructors, this link appears in the student and author view. When users click on “Bookmark It!”, a window pops up that enables users to bookmark the section. The title field is auto-populated with the title of the section, but users can modify it, if they wish. Students and instructors have the option to add notes for the bookmarked section. 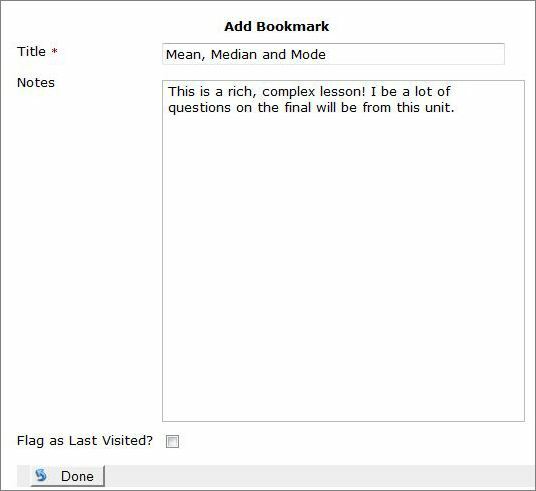 Students can use this feature to record observations they make while reading Module sections; instructors can leave notes to themselves while building their content, to return to them later. Instructors and students can flag a content section as “Last Visited”. This feature enables users to quickly return to where they left off in Modules. When users check a new section as ‘last visited,’ it overrides any previous. A link to the “Last Visited” bookmarked section is included on the home page of Modules (top right corner). By clicking on “Last Visited”, instructors and students are directed to the section that they had bookmarked as such. Instructors are taken to the “Last Visited” bookmarked section in edit view. To access their bookmarked sections, users can simply click on My Bookmarks. In “My Bookmarks” screen, users can edit their bookmarks (title and notes), they can delete them, or navigate directly to the bookmarked content section of the module by clicking on the hot link of its title (see Title column above). Students are taken to the content section that they bookmarked; instructors are taken to the author view of the section. If users had flagged a bookmark as “Last Visited”, it will be listed FIRST in their list of bookmarks. Clicking on Return takes users back to the content section from where they accessed “My Bookmarks”. Students and instructors can export their bookmarks and notes to their desktop. The downloaded file includes the title and notes of each bookmarked section. The notes are exported in a simple text file (.txt) and can be opened in any editor or word processor. The title of the course is automatically appended to the downloaded filename of the notes so that users can identify their course notes across different classes that they may be taking or teaching in Etudes.